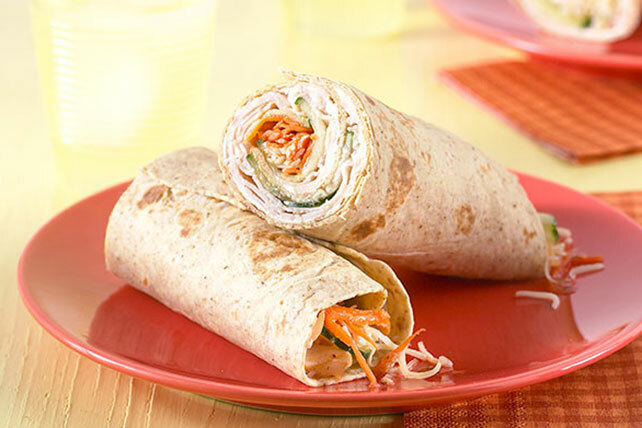 Fresh veggies with Italian dressing and cheeses give this fabulous turkey wrap its Tuscan-inspired deliciousness. Spread tortillas with reduced-fat cream cheese. Substitute OSCAR MAYER Deli Fresh Ham for the turkey. Wrap roll-ups individually in plastic wrap. Refrigerate until ready to serve. Pair this recipe with fresh fruit and fat-free milk for a great take-to-work lunch.